The 2016 NH Grand Prix competition continued the evening of July 23rd with a road race/country concert event in Londonderry. 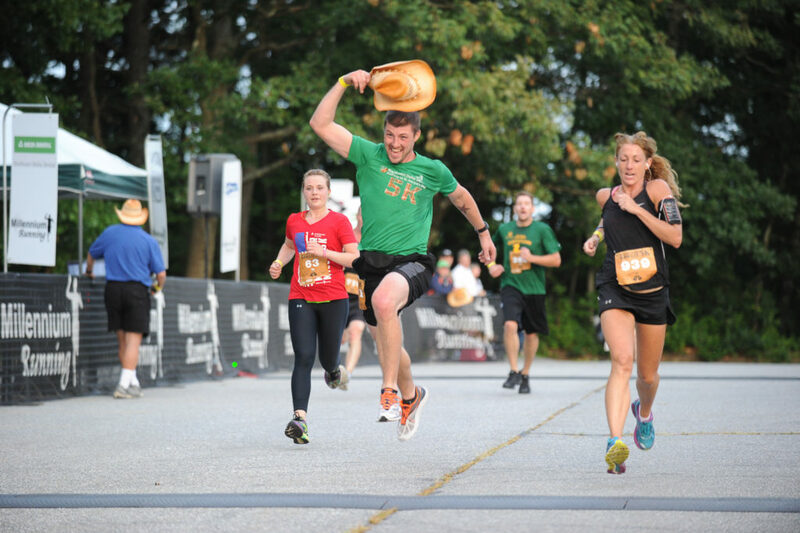 After a 40 minute lightning delay, the Boot Scootin’ Boogie 5k kicked off without a hitch. Host club Millennium Running gave series leader Upper Valley Running Club the closest challenge any club has given them in a single race this year. Both club tied for the top spot on the day with 147 team points. Greater Derry (111) and Gate City (109) followed as a distant third and fourth. Upper Valley now holds a 336 point stale on the series with three races left. Recent Londonderry High grad Noah Schrank outleaned Gate City’s Brandyn Naro for the men’s title while Millenium’s Mary Klene won her 2nd straight Boot Scootin’ Boogie race. Full team scores for the race are below. Be sure to visit our Schedule & Results page for all the up-to-date details on the 2016 series.